Anna Guillotte is on a journey to find the best way to express her great visual talent. She has studied various forms of media and different genres, but no matter the media or the genre, Guillotte has an uncanny knack for creating a whole distinct universe within every one of her pieces. Initially pursuing a career in movies and animation, a field for which she has deep admiration, Guillotte came to realize that she could import her cinematic vision to the medium of painting which better suits her introspective nature. "A year ago, I was painting on panels to create fine art, meaning art pieces that are narrative but that don’t have any specific story, like Le Petit Pessimiste, All is Vanity, and L'Hamburger. 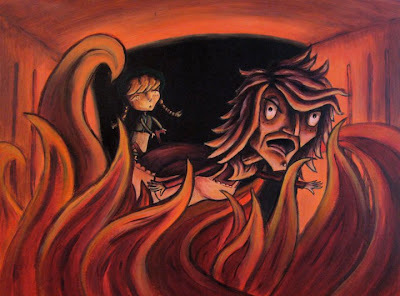 But this past year, I began getting involved with children’s book illustration as a market for my artistic style. So now, each piece that I produce does have a specific story and the intention is not to leave the audience guessing but rather to help the audience understand the story." For her illustrations, Guillotte either invents her own original stories or she chooses well-known stories that already exist. "I am fairly new at illustration, so mainly I choose scenes from stories that already exist, like the ones I did for Hansel and Gretel. My primary focus is to become a better visual storyteller and to keep making images. Most of my original stories are in the rough outline stage, but I do have one story that I have written and illustrated from start to finish. It is titled Color in the Sky." 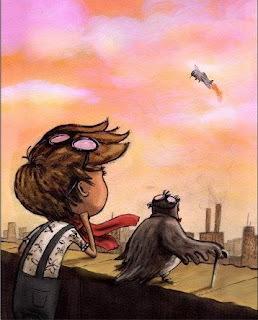 The image at the top of this page, of the tomboy and the pigeon admiring the soaring airplane, is from Guillotte's original story Color in the Sky. Even though this image was created to complement a particular storyline, it is strong enough in composition and rich enough in its multiplicity of themes that it can easily stand on its own. The angle and positioning of the main characters allows the viewer to immediately inhabit the scene and to easily identify with the sweetly wistful spirit of the piece. The attention to detail adds to the loveliness of the piece, for instance, the reflection of the sky in the goggles. 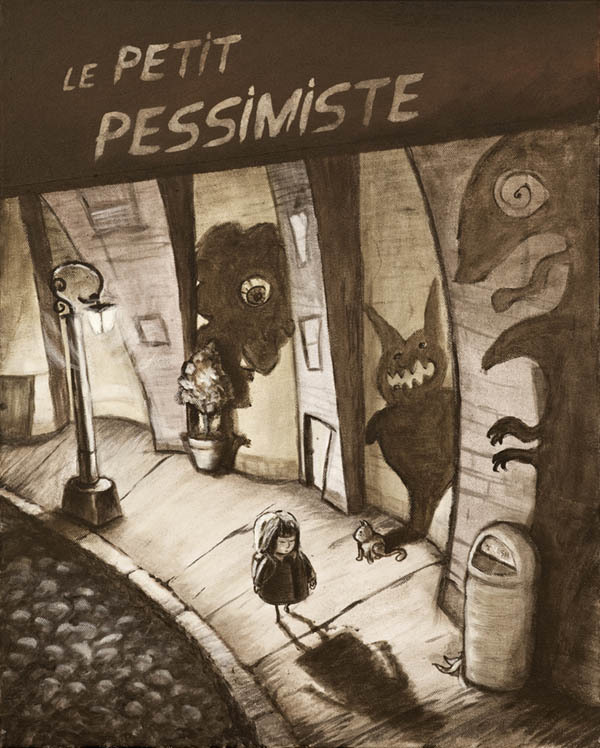 Designed as a homage to vintage French movie posters, Le Petite Pessimiste (or "The Little Pessimist") is one of Guillotte's earlier "fine art" pieces. And already, we see her strong sense of story-telling, her strength in focusing on a charismatic child character, a seamless blend of reality and fantasy, and a refreshing angle of perspective that aids the psychology of the piece. But even while Guillotte's strengths have remained, some of her abilities have clearly expanded, both in her use of color, in the confidence of her brushstrokes, and in her ability to communicate just as much, if not moreso, with an even simpler, less complicated scene. In other words, between these two pieces and the four years that separate them, Guillotte has learned many things including the invaluable art of opening a scene up to let it breathe with its own inherent energy. Of course, Guillotte wasn't going for a colorful mood in Le Petit Pessimiste, but she seems to have chosen the scene carefully according to her abilities at the time, which in itself is the mark of a talented artist. Interestingly, the chronology of Guillotte's color choices parallels the chronology of color in the movies. While the movies of the 1920s were awash in splendidly spooky black & white, they then shifted into pale color in the early 1930s, and finally to the glorious Technicolor that is best exemplified in the Oz scenes in 1939's The Wizard of Oz. Guillotte's work is so enveloping that the viewer may find it hard to believe the hardship behind the images, but her path so far has definitely not been easy. "Over a year ago, I really felt lost in my art career and sought outside guidance," Guillotte says. "I enrolled in an artist mentor program with the San Diego Fine Art Society (now called Art Pulse), which was created to help artists like me find their path and give them focus. In my application letter, I wrote: 'I know that this is my path and ultimately I will be a successful artist, yet at present I still tend to have doubts of what the universe will bring me next, if anything.'" One of Guillotte's fabulous images for the Brothers Grimm tale of Hansel and Gretel depicts the titular heroine tossing a villainous witch into a fiery oven. If there is any autobiographical angle to this piece, it seems to be that Guillotte has chosen to free herself of the obstacles in her path. Visually, it's astounding how three-dimensional and visceral the piece is, despite the fact that the lines are so simply drawn. Guillotte is basically teaching us a lesson in how much can be achieved with good composition and an amazing application of color. And, of course, those bulging eyes, that great angular face, and the snake-like locks of hair are nice touches, very long emphasis on the "nice". "I never even considered myself a storyteller until I got involved with illustration. My mentor basically had to write it out to me: 'Helloooooo! Anna! Have you looked at your work? YOU'RE A STORYTELLER!' and then it finally sank in. To be honest, I'm not sure why I am. I was never a big reader as a child or even today as an adult. My family didn't tell stories to each other." The fact that she was not surrounded by stories, while growing up, has worked out well for Guillotte, in that her images give off a special freshness and vitality. 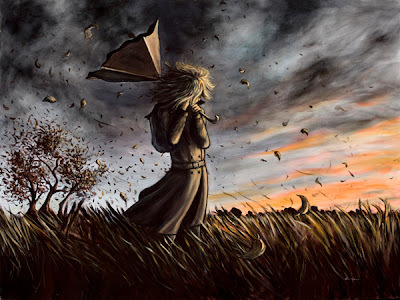 And, her stories aren't rehashes of the same old black & white morals made famous by the classic fairy-tales, rather Guillotte shares snapshots of her journeys, both the one from girl to woman, and the one from novice artist to master. On top of all that, Guillotte's wry sense of humor keeps all the seriousness of her work in check. 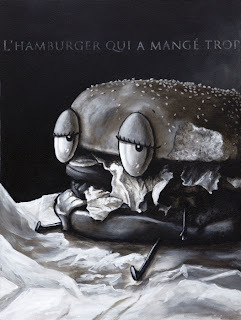 "The Hamburger That Ate Too Much is about over-indulgence. Everyone has over-indulged at some point and regretted it." We wish Anna Guillotte continued joy and prosperity. By continuing to combine her rich balance of humor and honest explorations of emotions with her gripping cinematic eye, she is sure to bring immeasurable more delight to the universe. Who knows what the future holds, maybe there will even be a return for Guillotte to the medium of movies. But whatever the medium and whatever the genre, we remain grateful for the worlds she introduces. Happy Winter Solstice, everybody! And remember not to overdo it with the eating!